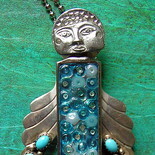 Submitted by Marjorie Cunningham, manager of Reclaimed to Fame Market at 1000 Markets and owner of Marjorie’s Cracked Plate Jewelry. I am primarily a self-taught artist. My mother is a painter and writer and was I exposed to a great deal of art and culture growing up. I have taken a few classes here and there. Most recently in the fall of 2009, I attended an ART of REUSE class at John C Campbell Folk School in Murphy, NC for a week. It was a wonderful, priceless experience. My instructor was very encouraging; I ended up with time recently after losing a job. I decided if not now, when so I have been able to get my shop set up and focus on my art. This is something I have wanted to do for many years. I have done different things over the years – mixed media, collage, shadow boxes, but really got jazzed up about jewelry after JCC. I came up with the name Secondhand Angels as I describe on my website. I started making Angel Pins a few years ago after my Aunt Frannie passed away. She was an exceptionally creative woman and very influential in my life. I realize now that making the angels was my way of feeling close to her. She is with her sisters in my banner photo. I started using odd earrings and pieces of jewelry. I have sold in local shops, but until now I have mostly made items as gifts for friends and family. I have recently expanded my vision with bracelets. 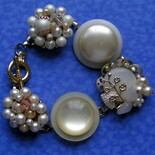 All designs are ONE OF A KIND; many are vintage and some are contemporary. 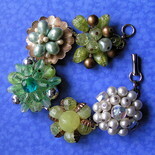 I use old and new buttons, items from the hardware store, sewing notions, beads and whatever strikes my fancy! 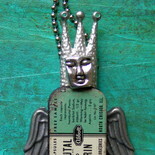 You may find an angel charm on most of my bracelets. I collect items at thrift stores, flea markets and all places in between. The collecting is just as special to me as assembling my pieces. Who were the women who once owned these pieces of jewelry? What were their lives like? Where did they live? I love preserving the history by recasting items into a new interpretation. I have also set up a fan page on Facebook and have over 100 fans in two days! Please stop by and join. I am proud to be a part of Reclaimed to Fame – I am honored. Thanks for this great post. I have seen Amy’s angels IN PERSON and they are GORGEOUS! Her story just melts hearts!